On this stay we performed the day after we arrived – twice, in fact. Our scheduled concert was at 6:30 PM, in the Church of the Holy Saviour, near the Old Town Square in Prague; but we had an appointment around 1 PM at the U.S. Ambassador’s Residence (the address is Ronalda Reagana, Prague 6), to perform at his Independence Day Celebration and attend the following reception. This was on June 30, in case you’ve been counting, and I still don’t know if he had the celebration early because we were in town or not. On the 29th, we went out for our usual tour dinner at the cafe of the Municipal House, which was within long walking distance of the hotel; the walk took us through main downtown Prague. The restaurant was an absolute Art Deco classic; I remember the restaurant as very noisy and the pork schnitzel as tough, but my was the room gorgeous. In fact, it was gorgeous enough that we went back and had a much quieter lunch on the last day, during our exploration of Prague. My notes on the 29th remind me that the late evening was disturbed by the total absence of information from the Ambassador’s staff about when we were supposed to turn up, when the bus would leave to take us there, and so on. We finally got a definite 10 AM call for next morning. I didn’t go down to breakfast in my performance costume, but some people did. I changed for the 10 AM call and threw a change of clothes in my backpack, and we all climbed in the bus. We got to the Ambassador’s house around 11 AM, and then we all, every singer plus Lynne, had to go through security to get in. They had a list, and I remember showing my passport but no other fuss. Mind you, the non-singers on the tour had this part of the day off. They weren’t invited. We met up with them at the church, later in the day. I have no photographs from this part of the trip. Jim had his camera, but he wasn’t invited to the Ambassador’s reception. I wasn’t sure how the Ambassador’s security would appreciate a camera, and in any case I was traveling extremely light. But one of the basses, Keith Nomura, did have a camera; his photos are on Shutterfly. You’ll have to click on the link to see the photos; Shutterfly doesn’t let me embed photos. Do click on the Shutterfly link and go look at them; you can see us all lined up to be cleared for security, plus 15 other photos showing the house and bits of the reception. The official embassy site has a photo of the official residence, called Petschek Villa. It was built in the late 1920’s by a German-Jewish banking family called Petschek, during the brief first republic of Czechoslovakia. The page at the photo link has a brief history of the Petschek family, and the history of the house until the U.S. government bought it in 1948 for use by the Ambassador. What isn’t shown is the yard in front of the house, which was huge. It was big enough for a horseshoe of food and drink booths that took several minutes to walk from end to end. At a guess, I’d say there were booths for every major U.S. firm doing business in Czechia at the time, plus all the big Prague hotels; and all the food and drink was free. I couldn’t begin to guess how many people were at the reception; the 45 singers vanished into the crowd. We had lunch at the booths first, very good food, then we lined up and sang the Star Spangled Banner at the opening of the festivities, just after noon. Then we stood, in formation on the veranda in front of the house, through three official speeches (all in English and repeated in Czech), after which we came out again and performed an arrangement of The Water is Wide. Then we sat around eating and drinking until after 2 PM, when Andy and the bus arrived to take us on – to the church, for a 3 PM rehearsal before the 6:30 PM concert! I wish I were making this up. The Church of the Holy Saviour is also called St. Salvator’s Church. 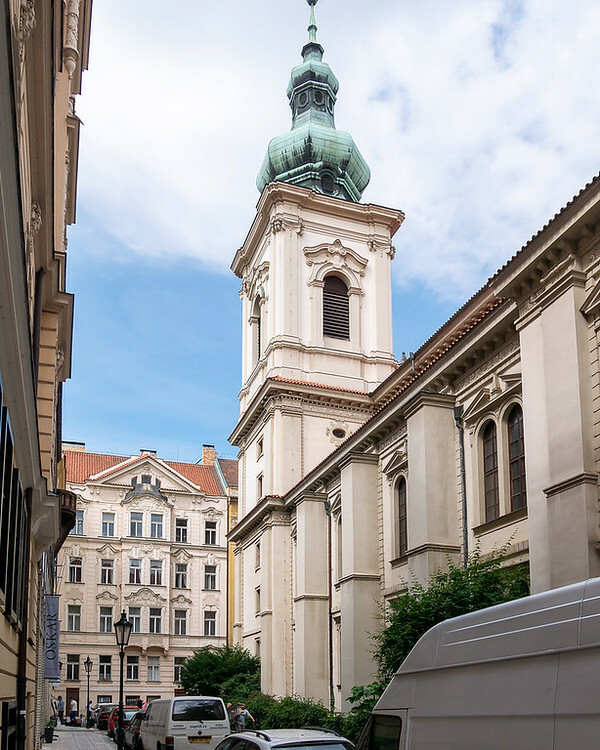 To be honest, if the tour itinerary hadn’t included the street address (Salvátorská 1, Old Town, Prague 1) I’m not sure I could have identified it, as Google finds three churches of this name or something like it in Prague, all in more or less the same section of town. And the web sites for all of them are in Czech. 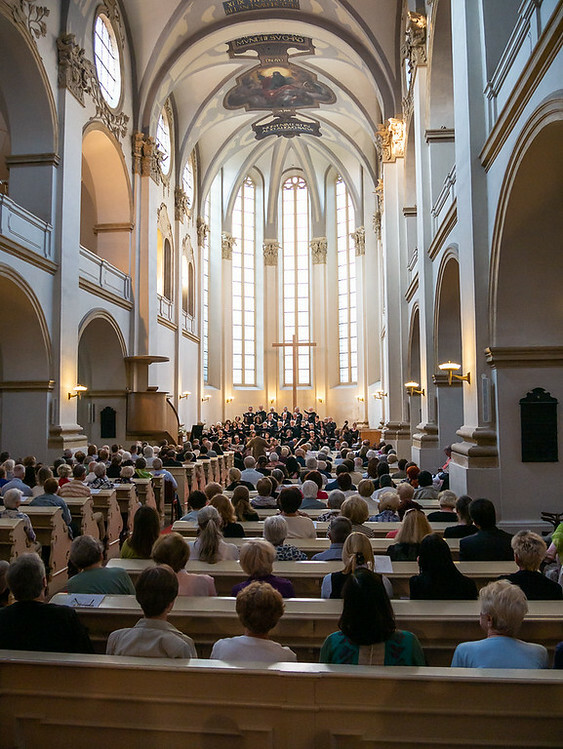 However, an English language site called Prague Experience had a brief note about it which nailed it down – it was the only Protestant church we sang in. See the Prague Experience note for the history. The Czech Brothers Evangelist Church, which owns the building, evidently puts the choir somewhere else, if it has one. They may well go in the balconies above the pulpit, which you can see in the next photograph; click on any of the photos to see the full gallery. The chamber chorus did a small set for this concert, and there was a ring of chairs around the platform where some of us could sit while they rehearsed. After the performance the bus hauled us back to the hotel, and Jim and I walked down to Wenceslas Square and split a chicken sausage. This entry was posted in Personal, Photography, Vacations and tagged Oakland Symphony Chorus Tour 2015.